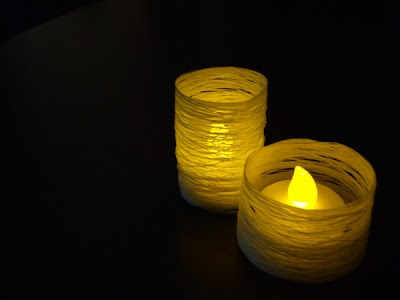 C(oi)n:purse had an amazingly eco-friendly, budget-minded, handcrafted idea for making tealight centerpieces out of thread (yes, thread!). I love that this project involves cardboard and plastic straight out of the recycling bin! The directions are so clear and easy to follow! Bulk Stores rule! No wrapping, no packaging, no frills – just about anything you may need sits in large bins, ready to scoop. From pasta to peanut butter (self-ground) and anything in between. Just go easy on those chocolate chips. BYOB (Bring Your Own Bag). Bring a cool-looking tote to take your groceries away in, and forgo those plastic carrier bags that stay around for the next few millennia. Recycle. Most cities and towns have a recycling program in place for paper, glass, tin, even kitchen waste. Garages will take your old car batteries and tires. Many hardware stores will take your old paint, batteries and old CFLs. Lug Your Mug for take-out coffee; many places will even give you a discount for it. Avoid take-out food. I know, that can be a challenge on a Friday night. But all those plastic and foam take-out boxes produce a big stream of toxic garbage. Eat home-cooked meals. Okay, another potential mine field here, but let’s face it: all those plastic and aluminum trays that those frozen dinners and prepackaged meals come in don’t really compensate for their overload of sodium, saturated fats and missing vitamins. Drink tap water instead of bottled water. Evian and Perrier are no longer cool. Repair, don’t throw out. Need I say more? Buy durable. Sure, it may be a little bit more to get the better quality product, but it will last much longer and always pays for itself in the long run. When buying things from bulk bins, you can avoid using those plastic bags by bringing your own tupperware. Customer service will weigh them for you before you fill them and the cashiers will subtract that weight from the total weight before charging you. First, I want to thank you for your blog - it made me see how many choices are really available out there, besides the "run of the mill" wedding! I'm just curious, what's wrong with bottled water?